My 16 month old iPhone 4S had a hardware fault – the power button on the top of the phone would not press properly – it was partially stuck. You had to push the button with all your might to get the thing to turn off, or just to turn off the screen. 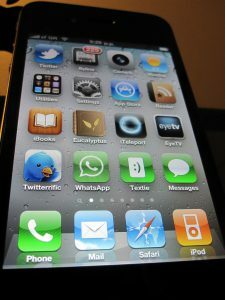 It turns out this is a very common iPhone 4 and 4S problem – see this and numerous similar posts on Apple’s forums. I’d bought the phone from the Apple Store online, so had to go to an Apple Store to get someone to have a look at it. As there is no store in Copenhagen or Brussels, I went to the Geneva store when I was working in Switzerland last week. I booked my appointment at Genius Bar, and – in French – started to explain my problem. Barely had I got to the end of the sentence and the guy knew exactly what I was about to report… But he couldn’t really help me – my phone was out of warranty, and I had not bought it in Switzerland. The latter is important, because my case for getting a new phone, for free, from Apple, was by citing Directive 1999/44/EC about guarantees for electronic goods in the EU. This basically says that if a fault was in the product when it was purchased, the manufacturer will have to take it back and replace it within the first 2 years – i.e. double the 1 year warranty that Apple gives. My phone was 16 months old, so falls into the 1-2 year gap. More details about the Directive here, and a legal case about it in Belgium here. I’d purchased my phone direct from Apple – that’s why I needed to go to them for the replacement. If I had the phone on a contract from O2 or Vodafone or whoever, I would have had to do all of this via the mobile phone company instead. The most senior person I spoke to was most amenable. Rather than ask about the phone directly, he asked about my history as a purchaser of Apple products. I’ve only had Apple computers since 1994, and said so. He even asked for the serial number of my MacBook Pro to check I was telling the truth – giving this reassured him that I was. He then said that, in this case, they would be willing to make an exception… So he put a note on my record with Apple, and said I could go to any Apple Store to get a replacement. So off I went back to the Geneva store to collect my replacement phone. “Comment est-ce que vous avez réussi à obtenir cela?” the guy there asked me. “Enfin, la raison que je suis à Genève aujourd’hui est pour donner des cours en politique de l’UE… donc je connais mes droits comme consommateur en droit européen!” So I handed in the old phone, received the new one from the store, and off I went. Mission accomplished. Turns out that European Commissioner for Justice, Viviane Reding, was talking about this just yesterday, and better enforcement of EU law at national level is planned. Good! Jan – as I stated on Twitter, if this had happened 2 years and 1 month after I bought it, then it would never have worked. The loyal customer stuff was the carrot, the EU law was the stick. “I’ve only had Apple computers since 1994”. Call me cheeky but I think you should have been entitled to a replacement even if the iPhone had been your first Apple product. It seems it was not EU law that helped you but the fact that you persuaded them you were a faithful customer. Yes, @alexhern, their web guy, helped me with the iPhone replacement suggestions, and then asked me if he could re-post it. Happy for them to do that! Nice to be directed here via the New Statesmen website. Did they contact you to republish the story?